mixing applications including multiple components. The proper powder mixer for an application requires knowledge of the different substances that are to be mixed together as well as their mixing properties. To determine the proper mixer for the application, the desired outcome or end product for the mixing application needs to be known. Commercial and industrial mixers are mostly batch but some mixing applications, such as powder to liquid, can be continuous. Batch mixers take a certain amount (batch) of product and process it for a certain amount of time. Once the product is processed, the batch is removed from the mixer and another batch can be placed in the mixer. Continuous mixers move the product through the mixer so that a continuous stream of mixed product is being discharged. Ross, 36 ft³ workable, double ribbon mixer with 304 stainless steel contact parts. Inner mixing chamber dimensions: 78" in Length; 30" in Width; 32" in Depth. Equipped with flip up cover, 24" long x 20" wide x 16" deep hopper with bottom (4) paddle sifter powered by a ½ hp drive, 3" OD mixing shaft with 1¼" wide x (3/8)" thick (outer) and 1½" wide x (1/8)" thick (inner) stainless steel ribbons powered by 10 Hp motor drive. 4" OD center bottom manual slide discharge with 35" ground clearence. Mounted on painted base. Paul O Abbe, 12 ft³, 316 stainless steel, double cone mixer. Equipped with (1) 14" ID product port with clamp down cover, 45" long x 42" diameter shell powered by 5 Hp motor drive, pin bar and 8" ID butterfly valve discharge. Requires 80" ceiling clearance with 30" swing radius / 60" swing diameter. Mounted on heavy duty base frame. 4 cu ft, high intensity PVC mixer. 20" ID x 24" deep vertical mixing chamber, 24" OD hydraulic flip-up, bolt down cover with (2) 5-1/2" and (1) 5-3/4" diameter top product ports, All stainless steel interior contact parts, two-part 4 wing interior mixing impellor system, with 6" OD shaft, (4) 8" L x 2-1/2" W x 1/4" thick wear edged mixing impellers and a 10-1/4" OD, 6-1/4" ID flanged side discharge port with (6) 3/8" bolts on 4-1/2" centers, 25/50 Hp dual speed motor drive with operator loading platform, control panel with start / stop buttons and amp / temp gauges. Provides controlled, rapid, homogeneous mixing of various types such as plastic resins, stabilizers, lubricants and pigments. 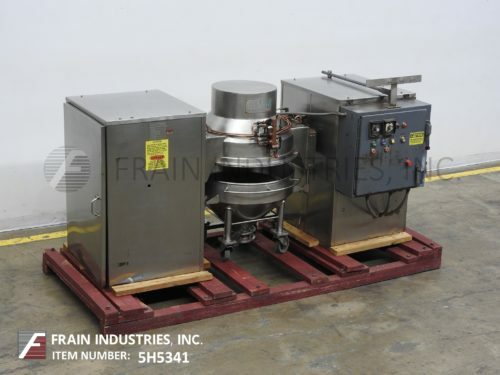 Ross, 1 ft³, double ribbon mixer with 304 stainless steel contact parts. Inner mixing chamber dimensions: 19½" in Length; 12" in Width; 14" in Depth. Equipped with flip up cover and lift out grate with safety switch, 1¼" OD shaft, with 1" wide (outer) and 1" wide (inner) x ¼ " thick stainless steel ribbons. 3" OD center bottom discharge has hand operated butterly valve with 33" floor clearence, vari speed ¾ hp motor with forward/off/reverse control switch and mounted on mild steel (4) leg base frame with casters.